US: Tibet’s spiritual leader the Dalai Lama celebrated his 76th birthday in Washington on Wednesday on a visit in which he will offer spiritual teachings to thousands and meet top US lawmakers. 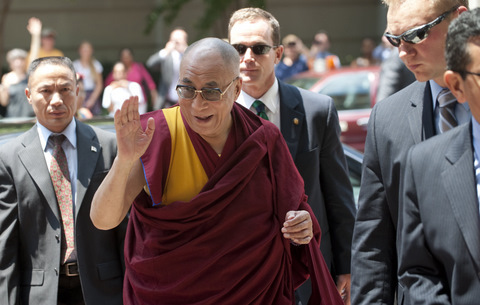 Tibetan spiritual leader the Dalai Lama arrives at his hotel in Washington, DC, on Tuesday. Tibetan and local well-wishers cheered on the Dalai Lama as he arrived on Tuesday at his Washington hotel, the latest international stop for the Nobel Prize-winning monk who shows no sign of slowing down his travel at his age. China opposes any international meetings with the Dalai Lama and the White House has declined comment on whether President Barack Obama will meet the Tibetan spiritual leader during his nearly two weeks in the US capital. Organisers expect up to 10,000 people to flock to an arena in downtown Washington as the Dalai Lama leads a 10-day Buddhist ritual known as the Kalachakra, in which practitioners meditate and pray for world peace. This Kalachakra marks the first in more than five years. It was last held in India, where the Dalai Lama has lived in exile since 1959. Obama received the Dalai Lama last year, but only away from cameras in the White House’s private residence. China nonetheless protested, as did a number of US lawmakers who denounced what they considered disrespect toward the religious leader. The US president also faced criticism at home in 2009 when he did not meet the Dalai Lama during a visit by the monk to Washington. White House aides worried a meeting would have soured Obama’s first trip to China later that year. At a congressional hearing last month, lawmakers from both major US parties urged Obama to show strong support for the Dalai Lama and to meet him on his current visit.